The WAGNER HiCoat coating concept, with its well-coordinated components, meets these requirements. HiCoat, which stands for "High Quality Coating", is the result of many years of experience in surface technology that have culminated in a technically mature design built on the seamless interaction of WAGNER components. Coating powder is best conveyed to the sprayguns if it is fluidized first. This is done in the Powder Feed Center, whose suction system (2) submerges into the container and ads fluidizing air to the powder. The container is placed on a special shaker table. As soon as it begins to vibrate a homogenous powder-air mixture forms. During the normal coating process powder is consumed, which leads to a lowering of the powder level inside the container. A probe measures the level and lowers the suction system when required in order to ensure a continuous powder flow. In the case of powder shortage, an alarm is triggered. Depending on the type of powder feed center, the consumption of coating powder is compensated either automatically or by manually adding fresh powder into the container. The fluidized powder is fed by the suction system (2) from the container to the injectors and finally to the sprayguns by means of fluidizing air. The amount of powder that flows to the guns can be increased by applying more feeding air. The addition of dosage air speeds up the powder flow. If the feeding air is turned off and the dosage air is opened completely, the powder supply to the guns stops, while the powder hose will be flushed with air. As soon as the feeding air is turned on and the dosage air is set to a normal level, the powder starts flowing again. Depending on the application, Tribo or Corona sprayguns are used for industrial powder coating. The powder particles are charged inside the gun and then applied evenly to the object to be coated. Different shapes and objects like wire goods, gratings or aluminum cross sections require different powder clouds for high quality coating. This is why sprayguns must be able to be equipped with a great variety of nozzles systems, such as deflector cones, fan spray nozzles etc. A considerable amount of powder does not stick to the object during the coating process. The so called overspray is sucked from the spray booth through the exhaust air conduct (4) and conveyed to the cyclone (5). The cyclone sets the powder-air mixture in rotation. This creates centrifugal forces which push the powder particles outwards onto the cyclone walls. The powder subsequently slides onto the screen surface of the screening unit, where coarse impurities are held back. By means of a peristaltic conveyer, the recycled powder is finally supplied back to the container in the powder feed center. To control the complex workflows within a powder system, several types of controls can be applied. The requirements for customer specific systems which are completely designed for special coating requirements are rising; systems need to be flexible and modular. Therefore WAGNER offers a wide range of modular control systems that guarantee the perfect control technology for each customer. As the heart of the powder supply, the powder center ensures that the required quantity of powder is fed to each application area (e.g. guns). Regardless from which powder container you convey the material, whether from the original container, drums, etc., our experts will assist you in selecting the right solution for your coating needs. Powder supply systems are directly integrated into the powder recovery unit. This eliminates the need for an intermediate powder feed. Color change can be performed quickly and easily by changing a container. The system can be used with up to 16 powder injectors. The integrated level sensor alerts the user when the available powder reaches a set minimum level to ensure that production is not interrupted. Through an integrated viewing cover, the user can quickly check the powder level and manually add fresh powdereds. 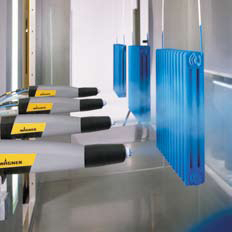 WAGNER application units are in use around the world and enable optimal coating results for all types of surfaces. The new gun generation achieves greater efficiency and perfection, both in manual and in automaticcoating applications. The WAGNER manual units are the result of concentrating development efforts on greater gun performance. Thanks to their user- friendly design, the guns are easier and faster to work with. Two types of WAGNER HiCoat automatic guns are available. The compact variant is designed for universal application. The XL variant was conceived specifically for color change systems and is characterized by its streamlined design. Both guns are constructed for high coating output, high efficiency and a long service life. The high-performance HiCoat charging and atomization system can achieve perfect workpiece surfaces combined with optimal material utilization. With its two hand-held unit series, Prima and Bravo, WAGNER offers a system that is perfectly tailored to the user. While the Prima system offers very simple operation, the fully electronic Bravo system can store all air and electrostatic parameters as a recipe. Both systems make use of HiCoat C4 hand guns. Optimum coating results The WAGNER manual system helps to set the optimum high voltage and the associated powder output quantity. This allows a high penetration volume and a high level of efficiency. Smaller space requirements coupled with greater performance and flexibility. These are features that distinguish WAGNER powder booth systems. Ranging from low cost booth systems for entry-level applications and small operations to fully automatic powder coating units combined with pre- and post-coating, WAGNER has the right solution for a rapid color change and the efficient use of powder. In combination with our recovery systems, we offer optimal energy and material efficiency to lower costs over the long term and protect the environment. Stainless steel booths are used where an automatic coating system needs to be built on a small budget and in a rough environment. This indestructible and easy-to-maintain booth type ensures professional use over many years. With the ICF (filter) and ICM (multicyclone) recovery variants, units can be built for single color or multi-color systems. Wagner has extensive know-how in building booths for any workpiece size, ranging from door handles to semitrailers. The particular requirements in each case call for specific gun arrangements, motion systems and process flows. Environmental protection and material savings! WAGNER recovery systems separate the powder/air mixture that emerges out of a booth and returns the powder to the powder circuit. WAGNER offers two different systems: filter recovery and cyclone recovery. Filter recovery systems are used for single-color operations or, if the entire filter module is changed, for multiple color tones. They are characterized by a very high efficiency of over 99%. In contrast, cyclone recovery systems are used in multi-color operations since the cyclone can be cleaned. Cyclone systems have an efficiency between 95% and 98%. Depending on the efficiency of the recovery system, only a small amount of powder is lost. However, the amount of powder lost depends strongly on the transfer efficiency of the application system. This, in turn, depends on the type of workpiece and on the workpiece suspension. Generally, the overall efficiency of a system and the associated powder loss can be closely calculated based on the recovery efficiency and the transfer efficiency. The coating of complex parts such as the inside of enclosures require guns to move independently from each other. WAGNER offers various systems ranging from simple linear units to dynamic 3D coating with Z-axes. Thus, efficient coating can be achieved without investing in expensive robots. Powder coating technology is becoming increasingly complex, the requirements set for individual systems and equipment precisely matched to the coating task increase, and flexibility and extensibility are in demand. A development which is supported and promoted by WAGNER's consistent product policy.